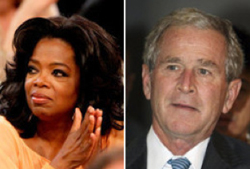 Former President George W. Bush and Michael Jackson’s parents are among the big names “The Oprah Winfrey Show” has booked for the November ratings sweeps. Harpo Productions released a schedule Friday, including a show featuring Bush discussing his memoir, “Decision Points,” on Nov. 9 – the day of its release. No date was given for the Jacksons’ interview. The production company says Katherine Jackson will talk about her son’s life from childhood stardom to his death. She’ll be joined by her husband, Joe Jackson. Singer and actress Barbra Streisand will appear for an interview and a rare performance Nov. 16. This is the 25th and final season of Winfrey’s talk show.